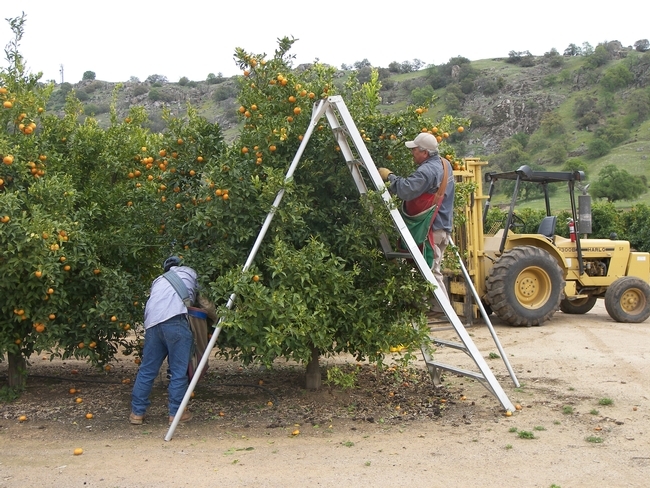 The photo shows an 8-year-old Tango mandarin tree at Lindcove that is being harvested. Dr. Mikeal Roose (UC Riverside Botany and Plant Sciences) is conducting research in this plot to look at various lines of Tango on differenct roostocks to see how they behave long-term. With the help of JBT FoodTech, Lindcove staff revamped the section of the packline we use for mandarins. 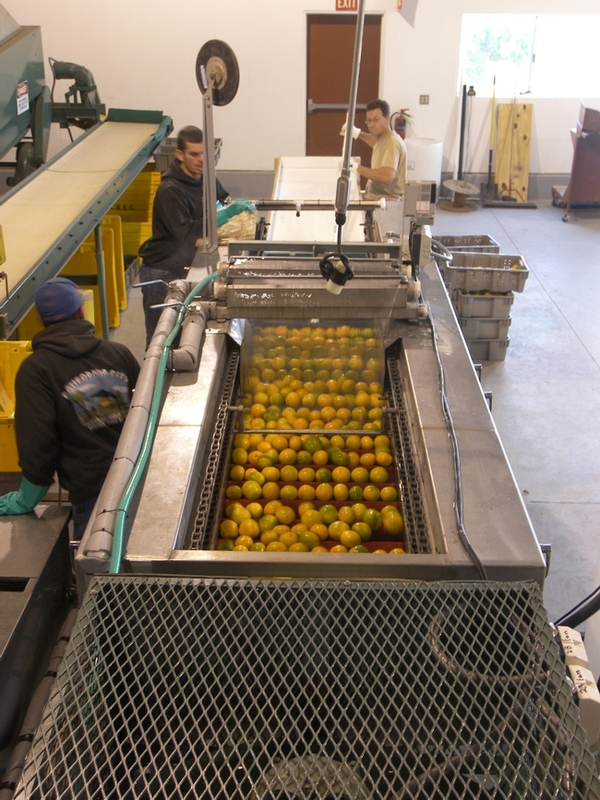 We can now load, drench, wax and dry mandarins and simulate commercial packing house treatments. We upgraded the mandarin line to help researchers respond to the industry shift towards mandarins. In this photo, Frost Owari mandarins from Marylu Arpaia's sensory tasting trials are being run through the line. Mark Beck and Kaye, visitors from Florida, arrived in time for the first fruit display and tasting event at Lindcove. Twenty-one varieties of satsuma mandarins were on display and while they were less than fully mature, the color and flavor comparisons were interesting to growers and nurserymen. We will retaste these varieties as well as some clementines on October 27. 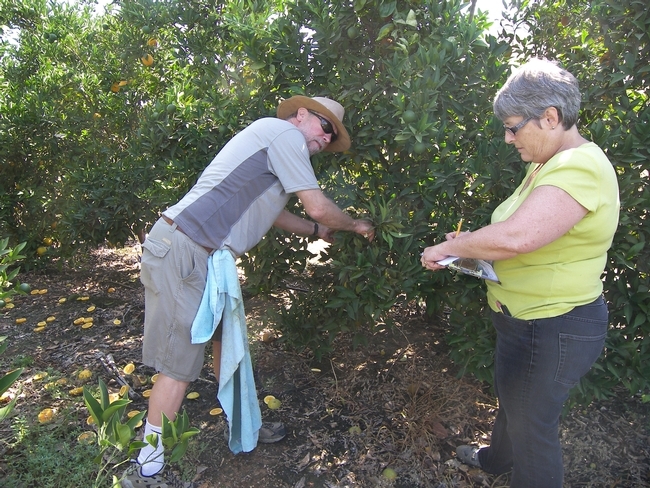 Staff Research Assistant John Bash from the Citrus Clonal Protection Program (CCPP) at UC Riverside directs the fall budwood cut at the Lindcove Research and Extension Center. The citrus trees that provide the budwood are grown inside Lindcove’s protective screened buildings and distributed from there to the nursery industry. The screening prevents insect vectors such as aphids and psyllids from reaching the trees and potentially infecting them with diseases. 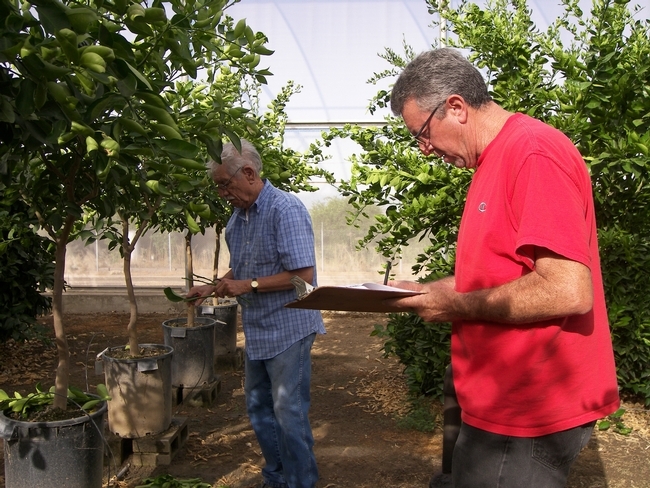 The CCPP screenhouse trees are tested several times per year to ensure they are free of all known citrus diseases. Raul Gonzalez, a retired Lindcove SRA, still enjoys assisting with the budwood cuts after 38 years of service to the University of California. 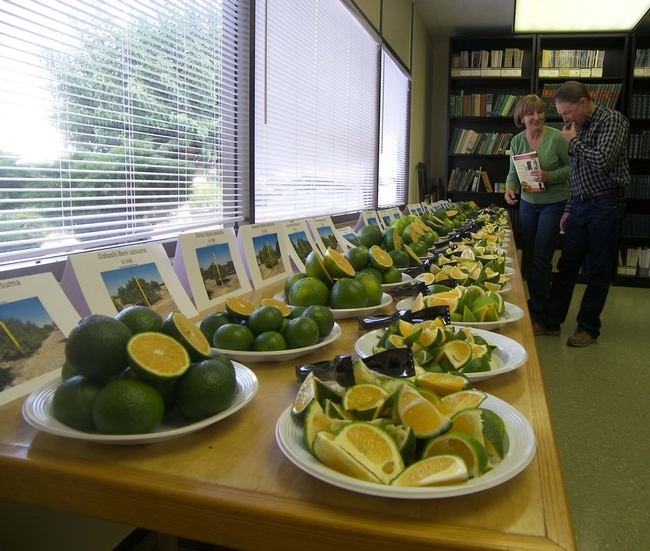 UC Riverside researchers Mikeal Roose and Tracy Kahn are evaluating seed content in Valencia oranges as part of a mutation breeding project to find new cultivars with lower seed content. Budwood of the existing Olinda Valencia cultivar was irradiated to induce mutations and trees were then propagated from the treated buds. The resulting trees are grown at Lindcove Research and Extension Center and then fruit from each tree are cut to determine seed content. Trees that produce many fruit with few or no seeds will be selected and a pathogen-free budsource will be established by the Citrus Clonal Protection Program. This budsource will then be used to propagate trees for replicated trials at Lindcove and elsewhere in California.